User records of 3,226 people who used the Luas website may have been compromised in a "professional cyber-attack", the company has said. However, in a statement this afternoon Transdev, the company that operates the Luas, said no financial information was compromised. 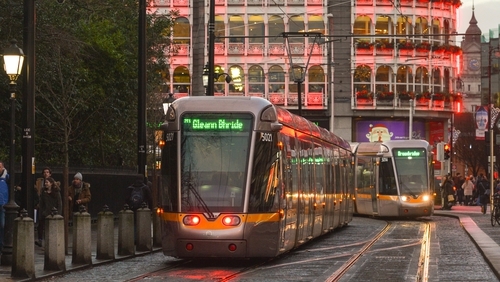 A message was posted on the website of Dublin's tram service saying it was hacked. Users trying to access luas.ie this morning saw a message that threatened to "publish all data and send emails to your users" unless "1 bitcoin" is paid in five days. One bitcoin is currently valued at €3,385. This afternoon's statement said the affected user records are of people who signed up to a Luas Newsletter. The company said these people will be contacted in the next 24 hours informing them of the potential breach. The Data Protection Commission has also been contracted. The site is being analysed to identify how the attack occurred and technicians are working to restore the service, the statement added. The Luas website was compromised this morning , and a malicious message was put on the home page. The website has been taken down by the IT company who manage it, and their technicians are working on it. Luas are informed this may take the day to resolve. The Luas service has not been affected. An information security consultant has said it is his understanding that the Luas website does not store any personal data. Speaking on RTÉ's News at One programme, Brian Honan described the threat as "hollow". "My understanding is that this particular website belonging to the Luas just displays maps and information about timetables and it doesn't store any personal data, so the threat to publish personal data and contact people via their emails, with the information that we have, would seem to be a hollow threat," he said.